Alfred Matthew 'Weird Al' Yankovic (/??j????k??v? ?k/ YANG-k? ?-vik; born October 23, 1959) is an American singer-songwriter, record producer, satirist, film producer, and author. Since his first-aired comedy song in 1976, he has sold more than 12 million albums (as of 2007[update]), recorded more than 150 parody and original songs, and performed more than 1,000 live shows. Yankovic's success comes in part from his effective use of music video to further parody popular culture, the song's original artist, and the original music videos themselves, scene-for-scene in some cases. He directed later videos himself and went on to direct for other artists, including Ben Folds, Hanson, The Black Crowes, and The Presidents of the United States of America. 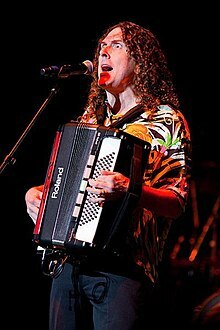 In addition to recording his albums, Yankovic wrote and starred in the film UHF (1989) and the television series The Weird Al Show (1997). He has also made guest appearances and performed voice acting roles on many television shows and video web content, in addition to starring in Al TV specials on MTV.